Sonny Collins published a novelette spoof of all those Hallmark movies that women love and men love to hate. There are nine different stories tied together by a challenge from an aging movie star to her daughter’s friends that they find love within a year. A fast moving parody that should leave the reader entertained and with a smile on their face. The novelette is available from Amazon. 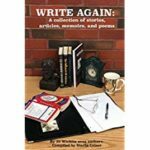 Starla Criser has published a story collection by 29 area senior authors, Write Again. The collection contains poetry, short memoirs, short fiction, and articles. It is available at Amazon, Barnes & Noble, and Watermark Books & Cafe in Wichita, KS.